Pleora Technologies will be demonstrating its video networking expertise for situational awareness applications. Leading military manufacturers have designed Pleora's video interface products into analogue-to-digital retrofit upgrades and new systems networking multiple cameras, image sources, and displays for closed hatch driving applications. At the show, Pleora will exhibit the iPort vDisplay HDI-Pro external frame grabber. The solid-state device is a compact, low-power replacement for PCs and display monitors where size, weight, power, or reliability are critical considerations. 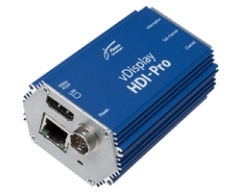 The HDI-Pro can be pre-configured to receive video from any of 32 cameras via unicast or multicast transmission, and can autonomously control up to eight cameras.